This is the third book in a series where the plot points carry over. All plot points will be resolved by book FIVE - the end of the series. This is a sweet style romance. With her heart at war with her mind, Lisa’s need to chase dangerous fun over boring responsibilities tugs at her emotions. Love is the last thing she expects to find, especially with her past revolting against her future. The only love Ryan’s heart has room for is for his motherless son. But, when he finds himself yearning for Lisa, Ryan has to convince himself and her that he’s all the thrill she’ll ever need. Will Lisa’s past destroy their future before either of them can accept the true meaning of love? Let me start out by reminding everyone that this is the 3rd book in a 5 part series. 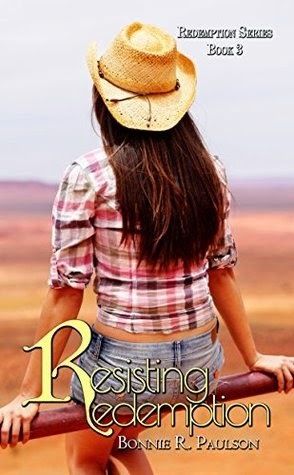 Before you read this one, make sure you've read Romancing Redemption and Riding for Redemption. These are the first two books in the series and since this one picks up pretty much where they leave off, I think you'll thank me for it. Personally, I'm glad that we got to find out Lisa's story. It was good to see her softer side and not just the aloof personality that we had seen up until this point. Honestly, y'all know by now that I'm a big fan of Bonnie's. It can be quite a stretch to find something in one of her books that I don't care for and for this book, it's only me being unsure that Jesse (who was born with spina bifida) could walk unaided the way he does in this part of the tale. Since that's not even close to a deal breaker, I suggest you pick up Bonnie's latest because who doesn't need some good romance in their life?